Crew Chief: Dale Primrose, Jr. Crew: Dale Primrose, Jr., Dale Primrose, Sr., Bill Richardson, Brant Wolff, Tyler Pettitt, Tanner Pettitt, Jay Wolff, Jake Graham, Colten Werner. Sponsors & Support: Norfolk Transmission, Primrose Trailer Rentals, Pettitt Plumbing, Heating & Air Conditioning, Burger King, Puppy Love, Dutton-Lanson, Island Supply Welding, Tempstar, Spieker Foundations, All-Star Graphics, Dean's Market, Crilly Ranch, Wolff Farms. Special thanks to Justin Addison, Todd Tony, Nelson Volbrecht, Sehi & Company, Terry Richards, and Tony Pendergast for help on the 2010 car. 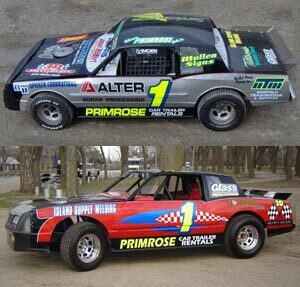 The pictures are of my 2006 Norfolk car (upper), and my 2006 Open Street Stock (lower). 59 A Feature wins in Street Stocks, NASCAR Stock Cars and Open Street Stocks. 2004, 2007, and 2009 Track Championships at Riviera Raceway. 2007 Track Championship at Boone County Raceway. Pepsi / Mountain Dew Championship Race win at Riviera Raceway inn 2004, 2005, 2007, and 2009. 2004 40th Anniversary Special win at Riviera Raceway. 2004 and 2005 Championship night A Feature wins at Boone County Raceway. 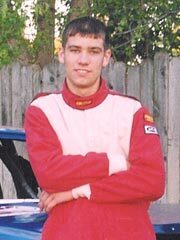 2007 Stock Car Nationals Feature win at U.S. 30 Speedway. 2007 Boone County Shoot-out win. 2007 Dennis Cumings Memorial win. 2009 Boone County Shoot-out win. I was introduced to racing by my family, which has raced through the generations, starting with my Grandpa, Dale Primrose, Sr., and then my dad and I. My team and I won our first A Feature together when I was 16 years old. I'm trying Modifieds in 2010. We are hoping to finish the car before most local season openers, and if so, we are looking for somewhere to race earlier.